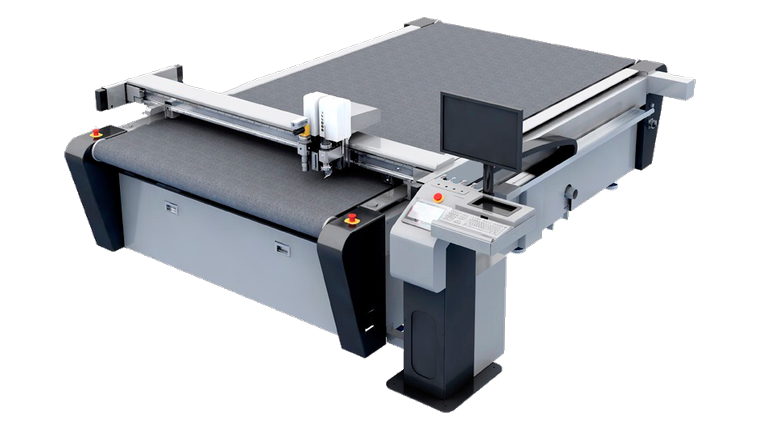 The KNF50 model is a cutting table with a high performance 6 axis movement control, that allows to map the cutting surface and obtain the perfect adjustment of the working depth. High quality hardware configuration (servodrivers, engine, line guides, belt, endless screw, everything of Japanese technology). Advanced structural design of the cutting surface with great vacuum capacity, ideal for big and small parts. Digital depth control: dotted cuts, half cut, full cut and folding. The vacuum area is divided in a way to make it simpler to hold still any size material. Maximun cutting speed: 1.200 mm/s. Simple change of tools, blades and folding wheel, easily handled by the user. Ethernet interphase. It can connect with several computers long distance and can be controled and updated remotely. Local HHDD. It stores up to 2 Gb of buffer memory, that you can use without the need of a computer. Ultra sensitive anti-collision security system - Safe and trustworthy. This machine meets the standard EN-60204-1 on Machine Safety. Electric equipment in the machines. Available cutting table messures: 1.300 x 1.100 - 1.800 x 1.500 - 2.500 x 1.300 - 2.500 x 1.700 - 3.000 x 2.000 mm.